Paints | MSDS Authoring Services Inc. Proper classification of VOC’s are based upon VOC exempt solvents and on LVP-VOC’s in the paint industry. Despite increasingly strict VOC limits at the state and federal level, formulators can incorporate performance based solvents and new surfactant technology to satisfy current Low Vapor Pressure (LVP-VOC) exemption criteria. A compound or mixture that meets any of the above exemption criteria will not count towards a product’s overall VOC calculation. We can calculate the above properties to determine if your paint will qualify. Proper shipping class of paints given proper exemptions is key to the creation of a proper SDS! Paint (UN1263) is the proper shipping name and description for paint, lacquer, enamel, stain, shellac, varnish, liquid aluminum, liquid bronze, liquid gold, liquid wood filler, and liquid lacquer base. Paint–related material (UN1263) is the proper shipping name and description for a paint–thinning, paint–drying, paint–reducing, or paint–removing compound. Some of these products are dangerous goods and must be prepared according to the applicable regulations. However, some products are not dangerous goods so it is recommended that shippers refer to the Safety Data Sheet (SDS) to determine if it is regulated for transport. Let MSDS Authoring help you determine how your paint will ship. 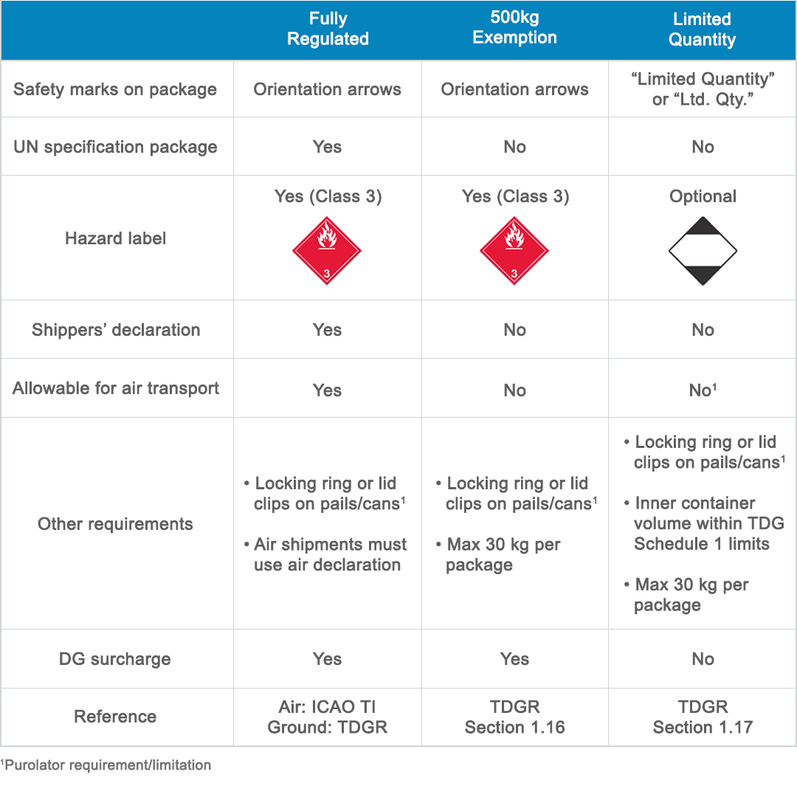 The following table provides a summary of the requirements for tendering paint shipments that are dangerous goods to Purolator for both air and ground transport. Inks are defined as colored liquids used for writing, drawing, etc., and liquids and pastes used in printing. Printing inks usually are mixtures of finely divided pigments, such as carbon black suspended in a drying oil. Inks having hazardous characteristics are generally classified as combustible or flammable liquids. We, at MSDS Authoring, can help determine if your inks will ship as hazardous material, Class 3, Flammable Liquid – Printing Ink UN 1210 or if your inks can qualify as Limited Quantity.